NPD Solarbuzz reports solar PV industry module revenues are forecast to decline 20% in 2013 to $20.5 billion from $25.5 billion in 2012. While revenues will remain below 2012 levels during 2013 and 2014, they are set to increase from 2015 onward. 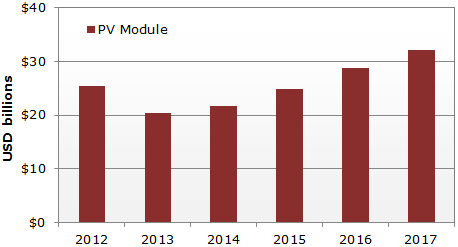 PV module revenue is estimated NPD Solarbuzz to reach $32 billion by 2017. NPD Solarbuzz says Confidence in the solar PV industry was severely damaged in 2012, as module average selling prices (ASPs) declined approximately 50% Y/Y, while end-market demand grew only 5%. This mismatch placed extreme pressure on the solar PV manufacturing sector, which had expanded its capacity during 2010 and 2011 to potentially supply 45 GW to an end-market that reached only 29 GW in 2012.